Growing up Catholic, we couldn't eat meat on Fridays, so fish sticks, grilled cheese sandwiches, pizza or spaghetti with tomato sauce were usually our only options. Sundays were 'Family Going Out to Dinner' days where we might try lobster tails or shrimp cocktail but they didn't count on Fridays. My Dad said he used to eat creamed tuna on toast when he was in the Army. (The men called it ‘S**t on a stick'.) But creamed tuna on toast wasn't the dreaded tuna noodle casserole. That was toxic, something that invoked pure fear. How could I have forgotten that? Many, many years later I made that tuna noodle casserole and served it to my family.....my husband, Ted, daughter Danielle, and son Brett. No one uttered a word as I placed a plate in front of them and told them to "dig in." Ted took the first bite and Brett did the same, while Dani played with her food, moving it around on her dish so that it would look like she was actually eating. Now it was my turn to take a taste. All eyes were upon me. Dead silence as I took my first bite. The noodles were limp and soggy, the tuna in chunks. But why was the mixture green? I tried to put on a brave game face as I lapped at the food before me. It was awful, but I didn't want to give anyone the satisfaction of criticizing the meal that I had just spent over an hour preparing. Ted wouldn't eat it. Brett wouldn't eat it and Dani certainly wasn't going to try to ingest one more morsel. I hate to waste anything. Grams used to say, "Waste Not, Want Not," but I don't think even she would have tried my tuna noodle casserole. I placed the food in front of Taco, our mixed breed puppy. Taco sniffed, then walked around her bowl, to get a feel for this blob of goo mixture. Then she raised her head and looked directly at me with pleading, sad, brown eyes. My tuna noodle casserole story is embedded in our family archives. No one, not even our dog, ate the meal that I had so painstakingly prepared for supper that night. '"Waste Not, Want Not". To this day, Danielle is a vegetarian. I fear the tuna noodle casserole pushed her over the edge. Cook 6 ounces (3 cups) medium noodles using package directions; drain. Combine noodles, one 6-1/2 or 7 ounce can tuna, drained, 1/2 cup mayonnaise, 1 cup sliced celery, 1/3 cup chopped onion, 1/4 cup chopped green pepper, 1/4 cup chopped canned pimiento and 1/2 teaspoon salt. Blend one 10-1/2 ounce can condensed cream of celery soup and 1//2 cup milk; heat through. Add 4 ounces sharp process American cheese, shredded (1 cup); heat and stir till cheese melts. Add to noodle mixture, Turn into 2 quart Casserole. If desired, top with 1/2 cup toasted slivered almonds. Bake uncovered at 425 degrees for 20 minutes. Makes 6 servings. "Every Recipe Tested In Our Kitchen for Perfect Results in Yours"
I can't wait NOT to try this. Thanks for the 'heads up'. When my Dad was in the Army they used to call it Sh-- on A Shingle. 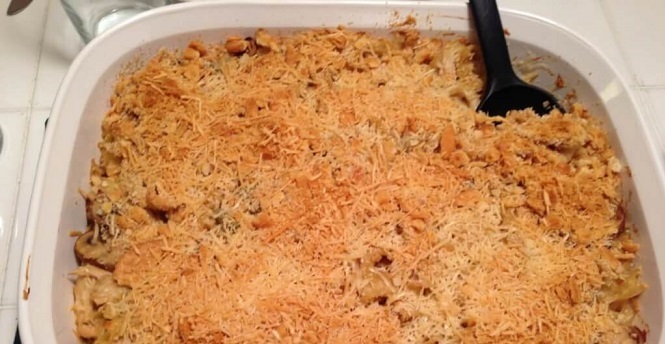 I, too, in my early days of married life would make tuna noodle casserole on Friday night. It was a recipe I could handle. Used Cream of Mushroom Soup and no celery at all. We were in love and it didn't matter how it tasted. M.E.